The day before my oldest son graduated from high school I was schooled in letting go, by a spirit named Robin. 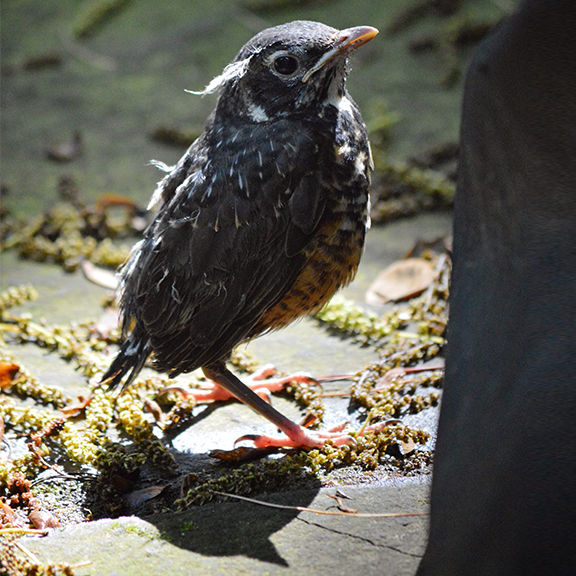 It all started when this sweet baby leapt its nest outside our bedroom, landed on the deck and was ready to take flight. I didn't think I would have enough time to grab my good camera, but after watching Robin pace back and forth for more than five minutes, I realized that I just might have all the time in the world. I don't know about you, but I never gave much thought to the process of a bird flying from a nest. In my very limited imagination I assumed it just flew, unassisted, when it was ready. I was surprised to witness the pacing, the uncertainty and the hesitation that Robin unapologetically exhibited until what I will now and forever refer to as THE SONG cut through the air. It was a short, but certain call, that I translated as THIS WAY. Again and again: THIS WAY. Robin kept looking to the left and then forward. Left. Forward. THE SONG kept coming from a nearby tree where two robins patiently sat, one with a mouth full of feed, the other, a few branches above, calling Robin forth. ...and, then, softly landed on the ground. THE SONG continued because Robin was not quite into the woods yet. There was one more ledge to go. Attempts to hide behind the fire pit did not silence the two encouraging parents...AT ALL. Eventually Robin followed THE SONG to the final ledge, beyond the prisonesque fencing, and took another leap, landing on the branch of an evergreen in the heart of Nature, Herself. Precisely where Robin belongs to live this one, precious life. I've been holding onto this gift of a story knowing that my son's graduation was nothing more than that first leap from the nest and that we had another ledge to go this Fall. It was a beautiful reminder for me that a parent's biggest, perhaps most important, job is to let go so their child can land in the heart of his/her Nature, wherever that may be. So often we think our job is to guide each other out of the woods, but I'm pretty sure our first job is to prepare each other to fly in—dangling a little food, singing THE SONG just a few feet ahead...enough to help each other realize that we're all equipped, in our own special way, to do whatever it is we came here to do. I find comfort knowing so many of you are perched alongside me on a branch right now guiding a loved one, and yourself, through some form of transition. I find even more comfort knowing that we are all just part of a chain of SINGERS singing THE SONG for each other. Wherever you find yourself right now—singing THE SONG or heeding the CALL...slow down, take it easy and look around. These parts are filled with magic, as long as you're willing to bear witness to it all.